It isn’t easy to think about recreating a community treasure. We’ve taken a survey, held community input meetings, put our architecture team to the test, and – most importantly – listened to kids about what they want in the new Joey’s Park. Well, here it is: a double zip-line, merry-go-round, see-saw, hill tunnel with an embankment slide and a walking path (yes, running, skipping and jumping are allowed). We’re keeping the castle-like feel – only the towers will be a bit higher, little ones get their own separate area to explore and – while we’ll keep the look of wood – it will be made of long-lasting, low-maintenance composite material. No more splinters! By popular demand, the double-wide slide stays and so will the tires and swings. Need a rest? Take seat … in the shade. We’re adding more shade trees and seating. Performers of all ages will discover a fun new musical feature and hit the pergola-covered deck for a show … or maybe an outdoor lesson … or a party. 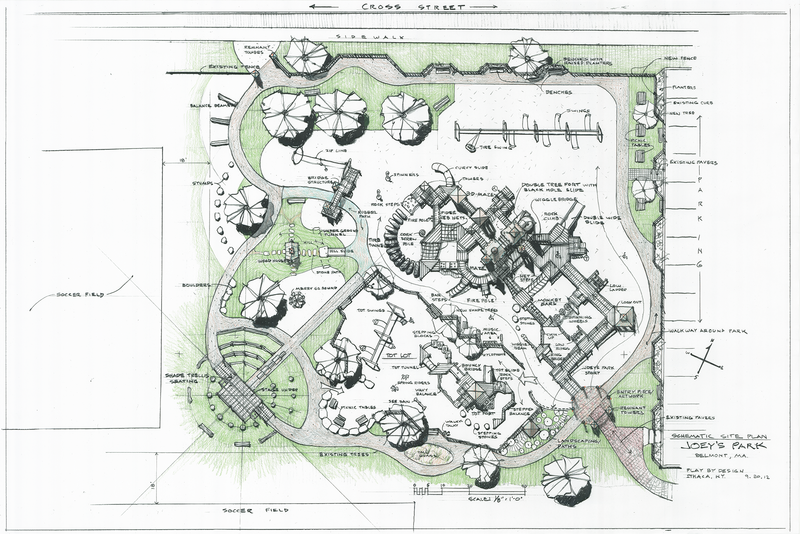 Like the original, uses for the new Joey’s Park will be as endless as a child’s imagination.